지난 5년 동안 이노비언들이 여가시간을 쪼개어 운영해왔던 이노비가, 1년전 5월1일에 맨하탄에 오피스를 열고 본격적으로 제2막을 시작했습니다. 지금의 더 큰 공간으로의 이사, 이노비 서울을 통한 봉사 확대, 무엇보다 더 많은 협력자 분들과 함께 할수 있어서 감사합니다. 이노비가 성장할 수 있도록 마음으로, 또 후원으로 도와주신 여러분들께 진심으로 깊은 감사의 인사를 드립니다. May is a special month to EnoB. May 1st marks the anniversary for EnoB's full-time staff members. Before that day, the organization relied mostly on volunteers. Thank you for everybody who supported EnoB for six years, whether it was a donation of their time or their services or through a sponsorship. We completed a successful concert in April for children who need special education and will provide four outreach concerts in May. We will continue to work towards fulfilling our mission, to share joy and love. I hope you will all continue to join us on our journey with support and encouragement. Thank you. 이노비 서울의 첫 공식행사인 완도에서의 첫 공연 일정이 잡혔습니다! 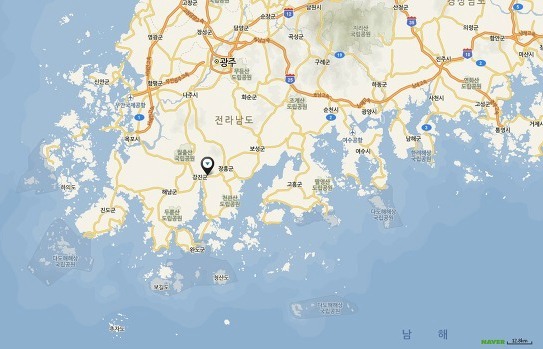 The first outreach concert of EnoB Seoul is scheduled for May 26th in Wando! 한국에 계신 이노비언들의 많은 참여 부탁드립니다. 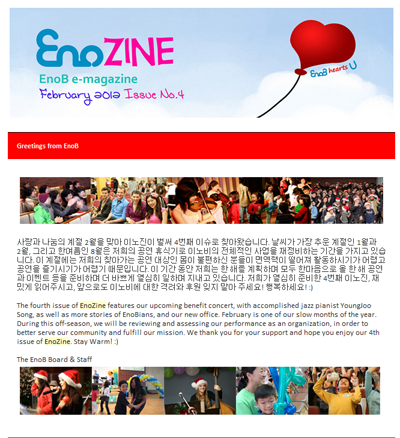 We hope that many EnoBians in Korea will participate. 완 도에는 약 250세대 이상의 다문화 가족이 있습니다. 다문화 가족 어머니들의 주된 출신 국가는 베트남, 필리 핀, 태국, 인도네시아 등 동남아권으로 이들과 결혼한 한국 인 아버지들은 지적장애나 신체장애등의 장애를 가지거나 다른문제점을 가진 분들이 많다고 합니다. 이런 다문화가족의 구성원은 문화와 여러 다른 관념과 관습의 차이로 가족내부의 갈등은 물론이고 사회적인 시선등의 외부적인 요인으로인해 사회에 흡수되지 못하고 있습니다. 이 가정의 아이들은 태어나면서 부터 지역주민등 한국인들의 일상적인 차별 과 외면을 받습니다. 한국인들은 다문화 가정의 혼혈 아이가모이 는 곳엔 자신들의 자녀를 보내지 않는다고 합니다. 이 노비가 앞으로 여러분들의 협력으로 더 성장하고, 능력이 많아져 서 저희의 선한 영향력으로 삶이 어렵고 힘드신 분들에게 행복이 가득한 삶을 살 수 있는 세상을 만들수 있기 를 간절히 꿈꾸며 소망합니다!!! between family members. As soon as they are born, the children of these multicultural families face discrimination and ignorance daily from other Korean neighbors. It is said that Korean parents don't want to send their children to where multi-racial kids are residing which attests to this ignorance and discrimination. 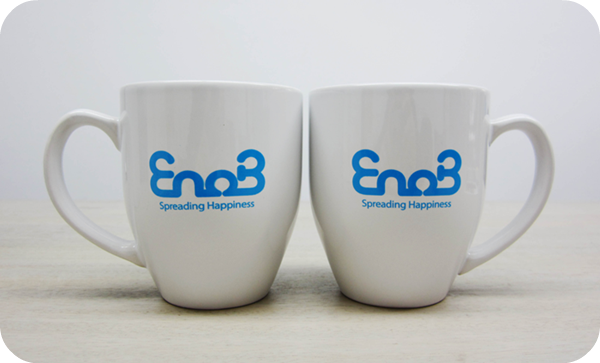 EnoB eagerly wants to grow more able and influential to spread our good impacts & happiness for those who need it most! 이번 이노비의 한국 첫 공연, 완도에서의 음악회의 음악감독을 맡으신 EnoB 공동설립자 이자 EnoB 예술총감독이신 박윤영님을 소개합니다. 박윤영 감독은 작곡가, 작가, 음악감독으로 미국, 영국, 한국 등에서 활동중입니다. 이화여자대학교 심리학과 졸업 후 서울예술대학 실용음악과 작곡을 전공한후 도미하여 뉴욕대학교 티쉬스쿨 뮤지컬창작 석사를 졸업했습니다. 미국인 작가 캐롤라인 머피, 엘리자베스 발칸과 함께 쓴 뮤지컬 '자전거 가게'는 퓰리처 수상기관인 '씨어터 포 더 뉴 시티'에서 매진 및 연장 공연을 기록하였고 올 3월 재공연에서는 뉴욕 타임즈에서 호평을 받았습니다. 한 국에서는 뮤지컬 '나르시시아'로 CJ 뮤지컬 쇼케이스 우수작품상, 뮤지컬 '김종욱찾기' 음악 수퍼바이저, 뮤지컬 '영웅' 음악코디네이터 등으로 참여하였다. 대본/작사/작곡한 뮤지컬 '내 마음의 꽃 리심'과 '광화사'가 곧 한국에서 공연될 예정이며 현재 서울예술대학 공연창작학부 외래교수로 학생들에게 음악과 뮤지컬을 가르치고 계십니다. EnoB joined to the 4th Walking Together Festival of NY Milal Mission, and gave a final stage (sponsored by the Beautiful Foundation USA). About two hundred handicapped children and their friends and families joined to the festival. 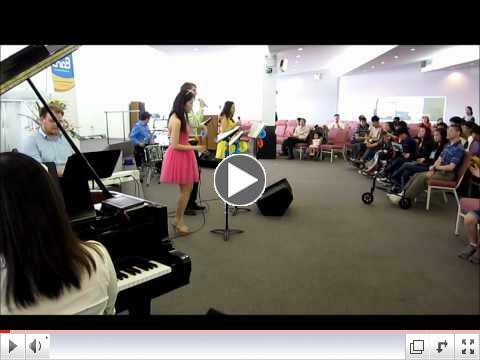 EnoB performed newly rearranged version of songs from the musical Lion King, Tarzan and est. and people in the festival loved the show! 모두가 즐거웠던 이노비의 공연속으로 함께 들어가 보실까요? 아래 동영상을 클릭하세요! Would you like to join to EnoB's outreach concert through a video? click below to view the video. 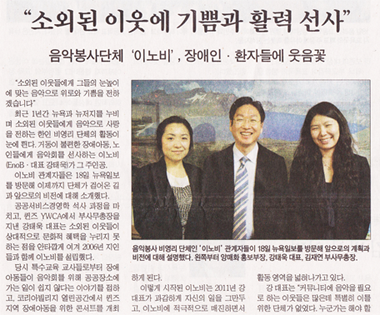 New York Ilbo covered EnoB. Click images above to view the articles! 뉴욕일보에 이노비 특집 기사가 실렸습니다. 위의 왼쪽 이미지를 클릭하시면 기사를 보실 수 있습니다! Click to view the Special ariticle of New York Ilbo on EnoB. Click the emage on the left to view the article. 오른쪽이미지를 클릭하시면 이노비 음악감독인 서혜선 뮤직디렉터의 한국일보 기사를 보실 수 있습니다. 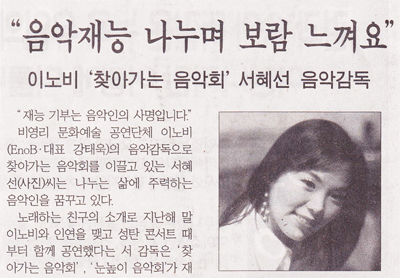 Ms.Haesun Suhwho contributes to EnoB's outreach concert as a music director was covered by the Korean Times. Shall we meet Ms.Suh in the article? Click the image on the right to meet her! 아래 날짜를 클릭하시면 이노비의 신문기사와 TV뉴스를 보실 수 있습니다. 지난 3월 이노비 베네핏 콘서트때 아름다운 유명패션브랜드 ShinChoi의 아름다운 드레스를 후원해주신 EnoB후원자, ShinChoi의 최신염(Shin Choi)사장님을 소개합니다. 성 공적인 사업가이신 최신염 선생님께서는 가정상담소의 Vice Chair 로 봉사하시며 한인 커뮤니티의발전을 위해 힘쓰시고 계십니다. 클래식음악과 오페라 를 사랑하시는 선생님께서는 좋은 것은 나눠야 한다는 이노비 의 생각에 적극 찬성이라고 하시며 이노비에 대해서 "젊은 사람들이 자기 자신을 위해서가 아니라 남을 위해 열심히 뛰 는 모습이 보기 좋다." 고 덧붙이시는 멋진 최신염 사장 님. 앞으로도 이노비에 많은 관심과 따뜻한 성원 부탁드립니 다. 이노비 후원자이신 최신염 선생님이 Vice Chair로 계신 가정상담소의 Benefit Gala가 5월 11일 에 있습니다. 더 자세한 정보는 아래 링크를 참고해 주세요. 이노비의 소중한 후원자이신 이지영님을 소개합니다. 이노비언들에게 3월31일에 열린 베네핏 콘서트의 사회자로 더 알려진 이지영 후원자님은 P&G아시아 헤드 쿼터가 있는 싱가폴에서 P&G전체 방향제(Febreze/ Ambi Pur)와 주방세제 (Joy)의 Global Brand Marketing Director로 일하고 계십니다. EnoB 를 강태욱 대표와의 친분으로 처음 알게 되었지만, 참여하고 후원을 하시고 이노비에 대해 더 깊게 알아갈 수록 "Spreading Happiness" 라는 뜻에 공감대가 강해지고 더 깊이 참여하고 싶은 마음이 드신다고 합니다. 앞으로 이노비가 할 수 있는 일이 무궁무진 하고, 또 세상을 깜짝 놀라게 할 잠재력도 지니고 있는 단체라고 확신한다며 저희에게 힘을 주십니다. 365일중에 120일이 세계 곳곳을 다니시는 출장이 차지할 만큼 바쁘고 능력도 많으신 이지영 후원자님께서는 휴식을 위해 짧은 여행을 가시는 걸 좋아하시고, 여가시간에는 요리와 테니스를 하시는걸 좋아하신다고 합니다. 올 해에는 P&G에서 베트남에 학교를 짓는 프로젝트에 참여하는 봉사를 하실 예정이라고 하시는 아름다운 마음씨를 지니신 이 후원자님. We introduce our precious donor, Cheeyoung Lee. She is famous for last EnoB benefit concert's MC to EnoBians. 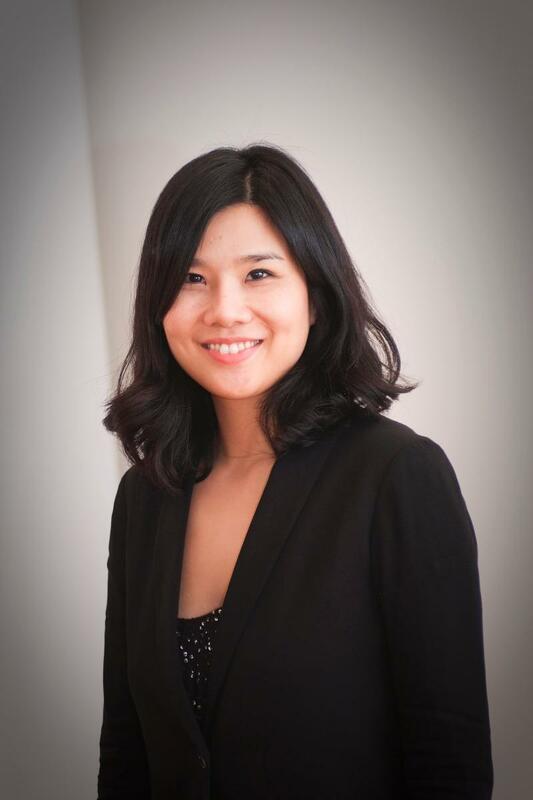 She works for P&G in Singapore where has P&G Asian headquarter, as a global brand marketing director of Febreze, Ambi Pur(air freshener) and Joy(detergent). She met with through her friend at the first time, but she said as knowing and participating in EnoB, I have been having strong sympathy with "Spreading Happiness". Also she said I have confident that EnoB has a lot of potential power which astonishes the world. We thank her for her cheering up. Ms. Lee goes on business trip for 120 days a year, so she is always busy. She likes to have short trips to relax and cook or play the tennis in her own time. In this year, she will join in the volunteer project of P&G that builds a school in Vietnam. As you see, she is a beautiful woman and can speak several languages; also she has good skAill in speech. We would like to invite her for the MC of next concert! 이 노비 창립멤버이시자 이노비 뉴욕의 이사로 계시는 김종현 이사님은 끝없는 도전정신과 봉사정신을 가지고 계시는 분입니다. 한국에서 카톨릭 대학교 재활의학과 교수로 재직하시며 강남 성모병원에서 진료를 하실때 부터 장애인 복지관에 매주 진료 봉사를 가시는 등 항상 사랑을 나누는 따뜻한 마음을 가지고 계시는 김종현 이사님은 현재 뉴저지 의과 대학에서 근무하시며 미국 재활의학 연구분야에서 새로운 도전을 하시고 계십니다. 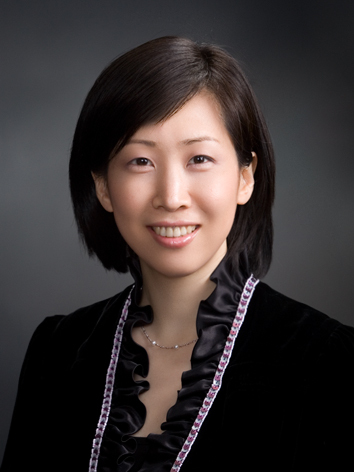 We are proud to introduce Dr. Jong Hyun Kim, our very own co-founder and chair of the board. 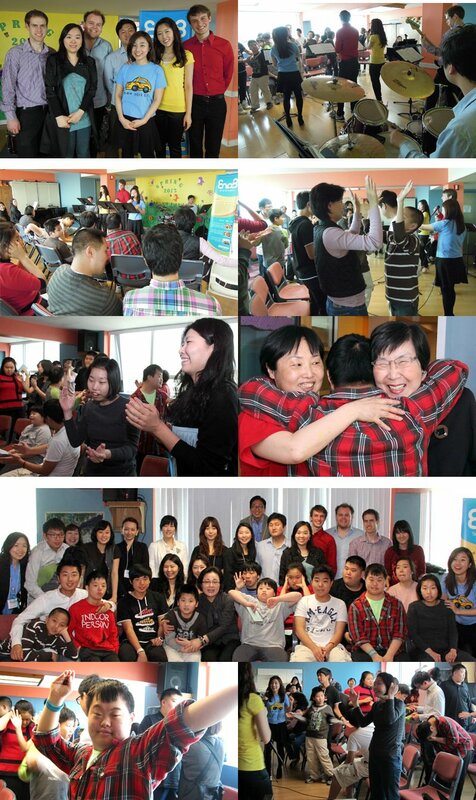 Dr. Kim's life is full of challenges and volunteerism. When he was in Korea, he carried out free medical treatment for handicapped patients in Seoul Community Rehabilitation Center in weekly basis. He is also a person who constantly challenges himself. 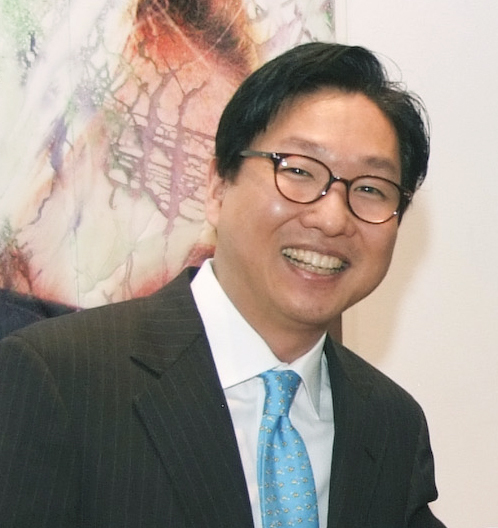 Even though he was formerly an assistant professor at the Catholic University of Korea Medical College, he is currently attending to the Department of Physical Medicine and Rehabilitation for new challenges and opportunities. In the future, he's willing to share his knowledge and experience in his field of study with people who need it most through EnoB. One of his recent joys is fencing practice with his son in high school despite his busy schedule. He is such a happy person that he make other people feel great, too. Please keep spreading happiness to all of us! 이번에 이노비 서울의 새로운 사무총장으로 부임하신 장혜원님을 소개합니다. 고려대학교 언어학과와 중국 중앙희극학원에서 연출과 연극학으로 석사와 박사과정을 마치신 장혜원님은 현재는 국립 안동대학교 한국문화산업 전문대학원 융합 콘텐츠학과 교수로 재직하고 계십니다. 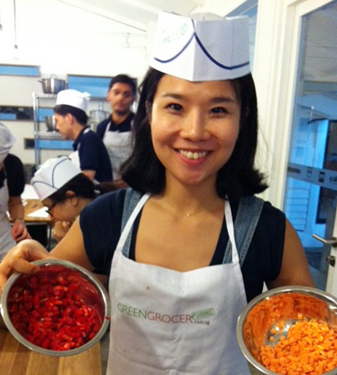 We'd liked to introduce to you Hyew-won Jang, EnoB Seoul's new Executive Director. She received her Ph.D and Maters degree in Art Direction and Dramatics from the Central Academy of Drama in Beijing, China. She holds a Bachelors of Art degree in Linguistics from Korea University. 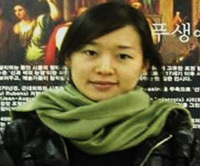 She is currently a professor of Department of Multiplex Contents at Graduate School of Creative Industry of Andong National University. 이노비의 Web & Graphic Design Manager로 함께 하게 된 정지용 매니저님과 인턴 김수나양입니다. 정지용님은 FIT에서 그래픽 디자인을 전공하셨고 김수나님은 명지대 정치외교학과를 졸업했습니다. 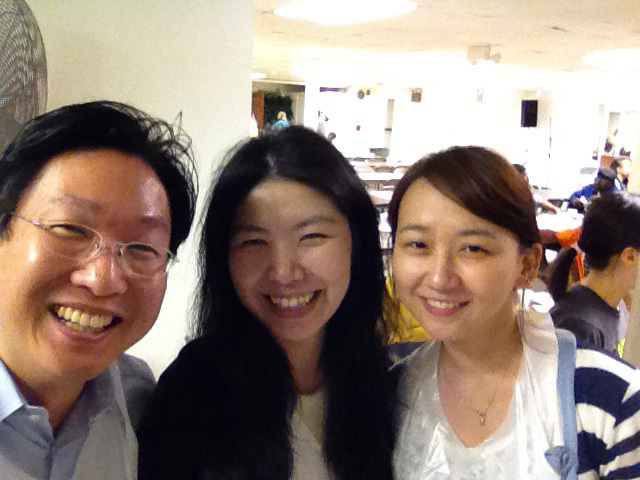 We introduce EnoB's New staffs; Web & Graphic Design Manager, Ji Yong Chung & Intern, Su Na Kim. Mr.Chung holds Bachelor of Fine Art in Graphic Design from Fashion Institute of Technology, and Ms Kim received a Bachelor of Art in Political Science from Myong Ji University. 4월 17일에는 맨하탄 할렘의 Soul Saving Station에서 뉴저지 초대교회 봉사활동에 EnoB강태욱 대표와 김재연 부사무총장, 이경아 인턴이 함께 참여하여 200여명의 지역 저소득층, 약물 중독자와 노숙자들에게 점심을 준비, 무료로 제공했습니다. 봉사활동을 통해 나눔의 기쁨에 대해 다시 한 번 생각하는 참 좋은 시간이었습니다. 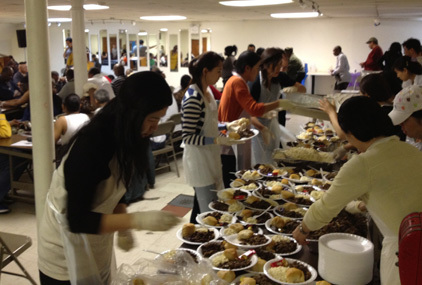 On April 17th, Tae Wook Kang, the president, Jae Yeon Kim, the Associate Executive Director, and EnoB intern Kyung A Lee participated in a community service program with volunteers from Chodae Community Church at Soul Saving Station in Harlem. We had such a good time providing delicious lunches for free to low-income groups, drug addicts and the homeless.. It was a good opportunity that gave us a chance to think about the happiness of sharing and giving again. 이노비의 Music Director 송영주님께서 뉴욕의 유명 Jazz Club "Blue Note New York"에서 공연을 갖습니다. 지난 3월 이노비 베네핏 콘서트의 감동을 기억하시는 분들, 그 때 참석하지 못해 아쉬우셨던 분들, 모두 참석해 보세요! 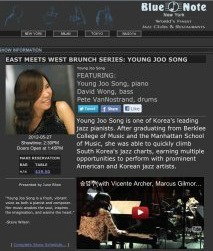 Youngjoo Song, the Music Director of EnoB, is going to perform at the New York's famous Jazz Club, "Blue Note New York." Do you still remember the impression you had at the last benefit concert in March? Or were you sad to miss it? Please come and enjoy this wonderful concert. 은혜가든과 드윗 널싱홈은 삶의 마지막 단계에 접어 드신 어르신들을 돌보아 드리고 있는 요양원입니다. 이노비의 방문이 어르신들께 조금이나마 희망이 되고 위로가 되어드리길 소망합니다. Mercy Garden and DeWitt DeWitt Rehabilitation & Nursing Center are nursing homes serving low-income and medically at-risk seniors. Their population are often abandoned or seldom visited by their families, so the relationships built can become an important lifeline for them. We hope our visits help lessen the isolation and loneliness that some of residents. 5월 19일 토요일에 열리는 "장애인 큰잔치'에 이노비가 참여합니다. 200여명의 특수교육이 필요한 청소년과 가족들을 위해 40분 동안 공연을 할 예정입니다. Milal Mission was formed to make a world in which everyone can live and love one another and inspire our society's interest in the disabled. 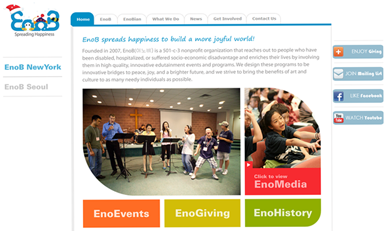 EnoB's outreach concerts have been co-hosted by Milal Mission for several years. EnoB will continue its partnership with Milal in 2012 and host further outreach concerts. 5월 25일에는 한국 완도의 다문화 가정을 위한 콘서트를 엽니다. 250여명의 다문화 가족과 청소년들을 위한 한국에서의 첫번째 아웃리치 컨서트 기대해 주세요! 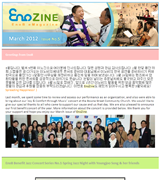 EnoB will hold the first outreach concerts in Korea. 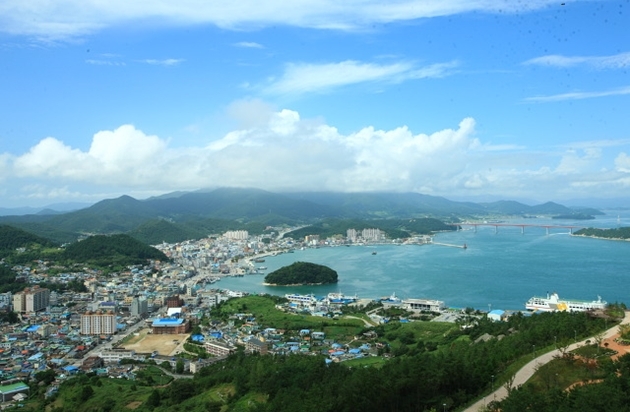 The concert is going to be held for multi-cultural families in Wando, South Jeolla Province in Korea on May 26th. 아래 이미지를 클릭하시면 지난호 이노진과 이노비의 웹사이트를 보실 수 있습니다.